Are you a plant lover? If yes, then we don’t doubt you look for new beautiful plants to decorate your home now and then. Consider a cute little aloe vera plant next time you’re shopping for house plants. You’ll thank us for our suggestion once you discover all the ways you can use fresh aloe vera gel. The aloe vera plant is indigenous to the Arabian Peninsula. Even though aloe vera is native to that region, it is now cultivated in other parts of the world as well, for scientific and medicinal purposes. It is a succulent plant, meaning it has thick and fleshy leaves and stems that retain water. It can grow and stay alive in regions with little rainfall. For this reason, it is also known as a desert lily. This plant is grown mainly for ornamental purposes because it requires less water and grows flowers in the summer that look absolutely exotic. Take note, too much water can dry up the plant faster. The aloe vera plant is not just effortless to grow but also has great medicinal properties that can cure many diseases related to the digestive system and other parts of the body. Various toxins, food remnants, and bacteria typically stick to the intestinal walls of our digestive tract, and aloe vera is often used therapeutically to help clear these out. Aloe vera is also alkaline in nature and helps to neutralize excess acid in the body, and has a laxative action to help aid digestive movements. It supports healthy digestion and a healthier immune system. It flushes impurities out of the body. It promotes better absorption of nutrients in the body. It provides and retains moisture in the skin when applied topically. 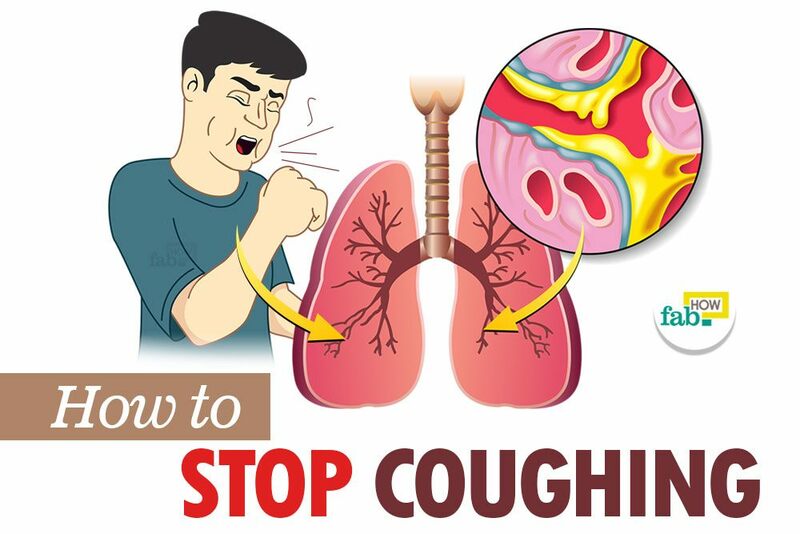 It helps relieve pain caused by inflammation of the gums, arthritis, eczema, and psoriasis. Are we blowing the significance of aloe vera out of proportion? Not really! This list is just the highlights. 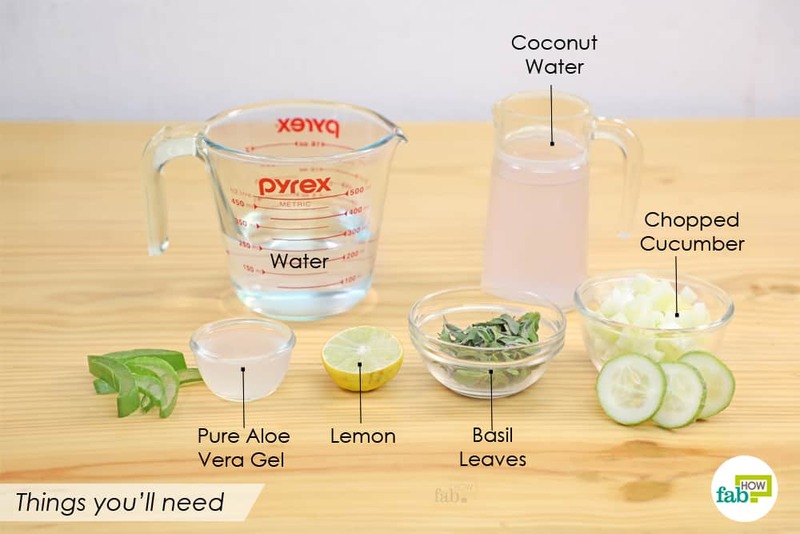 In this article, we’ll show you how to use an aloe vera water recipe to help your body detox. Put 1 to 2 tablespoons of aloe vera gel into a blender. Pour in 1 cup of unsweetened coconut water. 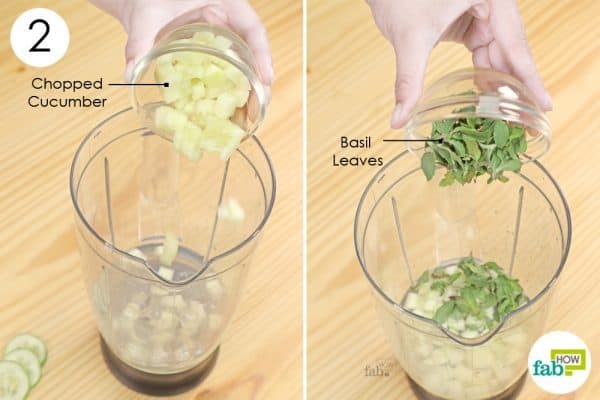 Add ¼ cup of chopped cucumber to the blender. Drop in a small handful of basil leaves. Add ½ tablespoon of lemon juice to the blender. Whisk the ingredients to make a smooth drink and strain the water. 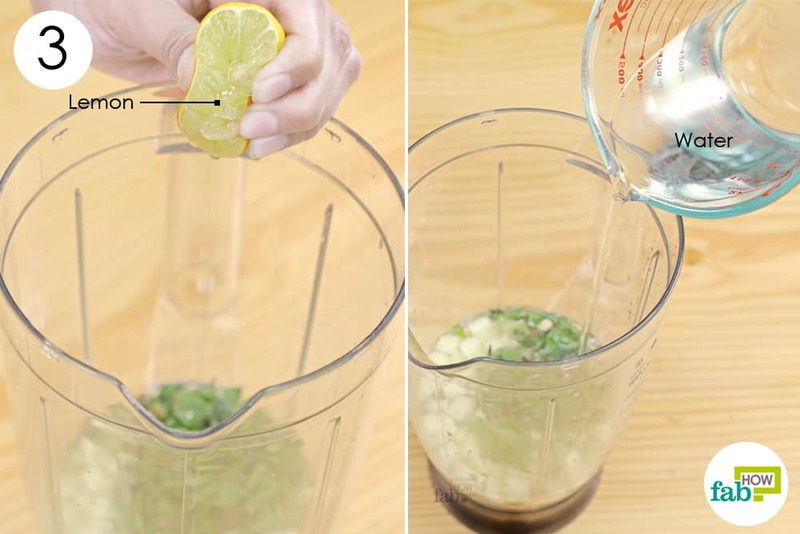 Run the blender until you have a smooth mixture. To catch any stray bits, strain the mixture into a glass. Enjoy your glass of goodness to detoxify your body and help you lead a healthier lifestyle. 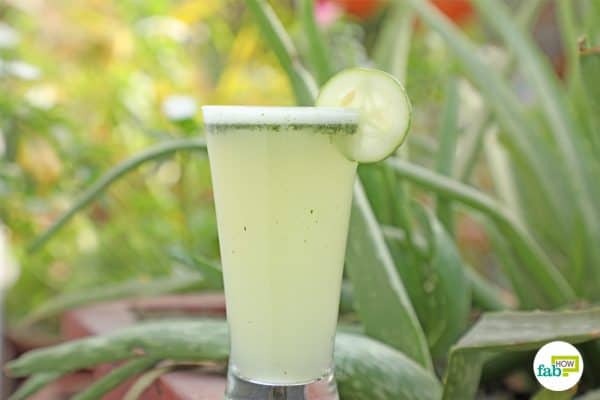 This aloe vera water recipe to detox your body serves only 1. You can increase the quantities of the ingredients as per the serving requirements. Do not consume this drink if you’re allergic to any of the ingredients. 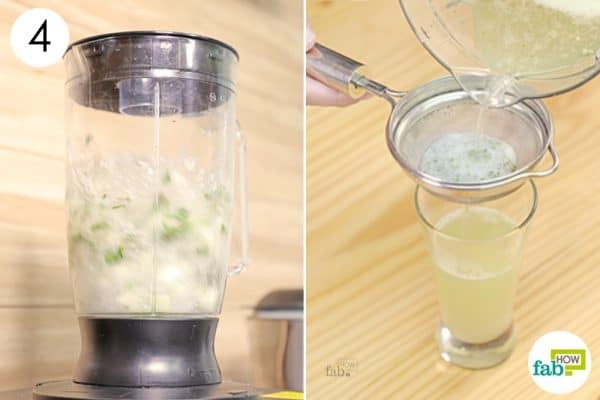 While extracting the gel out of the leaves, be careful only to scoop out the gel and not the greenish rind and the yellow layer on the leaf, which can act as a laxative. Do not overdose on undiluted aloe vera juice or gel, as it can cause diarrhea and intestinal cramps, leading to dehydration. Blends made out of aloe vera or even pure extracted gel do not store well. It oxidizes, and the medicinal benefits decrease within a short period. 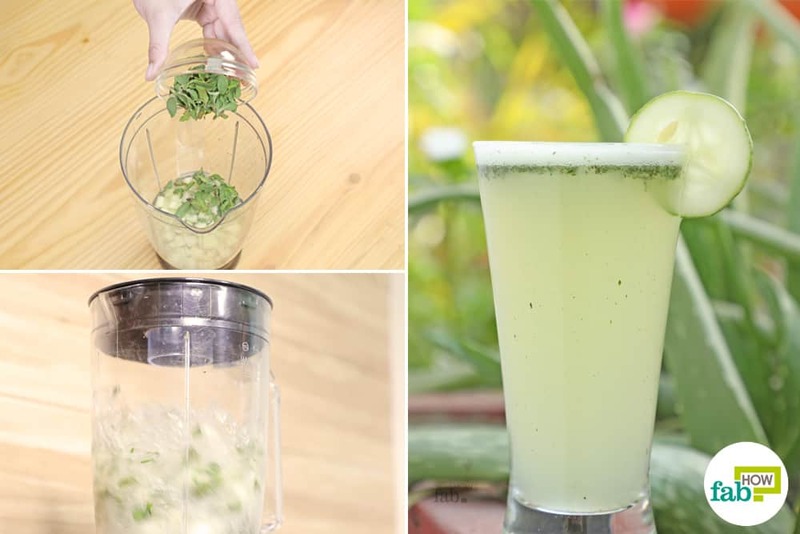 Make sure you extract fresh aloe vera gel out of the leaves every time you’re preparing a concoction. Also, consume it immediately. You can also consume aloe vera in the form of tea. If you’re growing aloe vera in your house, place it in a spot where it gets a lot of sunlight. That is definitely one of the best posts I’ve come across in a while. It’s nicely written and thought out. Thank you for your comment. Stay with FabHow for more such carefully curated content especially for you.